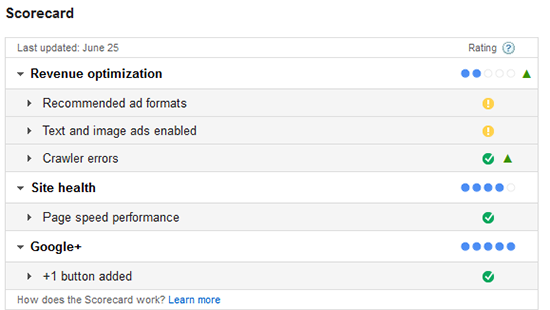 No doubt you’ve noticed the scorecard that appears in your Performance reports for AdSense. In a nutshell, this image gives you an idea of how your site is doing health-wise (page speed, crawl errors) and reveals if you are maximizing your earning potential. Notice I scored very low in revenue optimization. Here are some of the factors that impact this statistic. In general, certain ads perform better (typically the larger ones). So Google, of course, is going to encourage you to use the higher performing units. But you still have to test what works best for YOUR website and goals. The larger units may not fit or clutter up certain design layouts, so it doesn’t always make sense to use them. For example, Google keeps trying to get me to use the 300×250 unit for certain sites instead of the 250×250 unit, but it won’t fit with my layout on all sites. Something like this will negatively impact my scorecard because I’m ignoring their recommendations. When you create a new unit, Google recommends you always select text and image ads to give yourself a chance to display as many different kinds of ads as possible. Once again, know what makes sense for your site. Again, this will negatively affect my Scorecard. If you’ve ever received a crawl error in your account, it means that the Google spider is having trouble reading some of your content. This is important because the crawler helps Google serve up relevant ads. This stat is not listed under the Revenue Optimization section, and here’s why I think it was omitted. If you don’t use the maximum number of units, you could be limiting your earnings, right? At first, it may be logical to think that more is better. For the record, these ads will typically earn you more than the Contextual ads. Advertisers often look for high-converting pages, units, etc. So let’s say because you have too many units on a page, your overall site CTR goes down. That could actually impact how many placement advertisers target your site. So maybe that’s why “Number of Units Per Page” is not considered a factor in Revenue Optimization. More is not always better. I hardly ever put 3 units on my pages. In fact, I don’t know if I have any pages with three units anymore. Most of my pages have 1-2 units and I purposely spread them out to keep my sites from looking cluttered. I prefer to be heavy on the content and lighter on the ads. While our policies allow you to place 3 ad units, 3 link units, and 2 search boxes on each page of your site, placing the maximum number of ads on your page may make it look cluttered. If users can’t find what they’re looking for on your site, they may turn elsewhere for information. Also remember Google has been known to roll out algorithms that penalize sites with too many ads on a page. I think it’s good they didn’t include this stat in the optimization report. Did anyone else chuckle at this? Of course, Google Plus has to be a part of everything Google does. Having said that, who could blame them? It is their product, so of course they are going to promote it any way they can. This stat may not have much to do with your account or earnings, but from a marketing perspective, it’s somewhat clever. I can imagine many non-Google Plus users scurrying to add those Google Plus buttons on their pages in search of that “perfect” scorecard, and secretly hoping it may have some positive impact on their earnings. Once you make the recommended changes, your scores will improve and the positive impact will be indicated by a green arrow. At the end of the day, Google wants to maximize their revenue, so of course, they are going to provide you with tips that will hopefully increase their bottom line. Just remember, a lot of Google’s recommendations are based on global stats. What is good for them may not always align with your goals. For example, if your only monetization method is AdSense and you are trying to maximize your earnings to the fullest, you might take more of their suggestions. But if you have a more diversified approach like me, AdSense is probably not your only priority. I think the Scorecard provides a nice overview of what’s going on with your account, but I can’t say it’s caused me to change much. Now, if you scored low in page speed, crawl errors, etc. of course you’ll want to address those issues because that could limit some ads from showing and impact your revenue in a negative way. However, as I’ve already explained, there may be good reasons why you ignore certain ratings. Do what’s best for YOUR site. What do you think of the Scorecard? I just wonder if “Google AdSense Scorecard” still work right now? because I’m really new to Adsense. Wish to apply Adsense soon for my new site. thanks. I never know about Scorecard in Adsense. Really helpful information. Thank Lisa for your sharing! Thanks for the valuable article. i would to thanks for the “Avoiding Google Penalties and The Trick to Getting a Reply From The Search Team” article where you gather important points at one place. Nice tips lisa, your adsense score card is quite better than mine. Hi Lisa and other friends! I’ve looked at my Score Card now and then. I figured out that the ‘scores’ are – relative – like the Revenue Optimization: when I was newer at this, that made me nervous, and made me wonder. But, in short time I figured out it was relative. The examples you use help to explain how that number can be less important than it would seem. Thank you once again, I always come to you when I need a boost … with general website help; and when I need to learn and grow. Bye for now. I’ve never noticed about Scorecard in our Adsense. Really helpful information. Thank Lisa for your great sharing! Honestly! I’ve never cared about what score I’m getting with the stupid score card showing in the account. I only focus on increasing the earnings only overlooking it..
I’ve stuck with it for a couple years and I am just starting to break a decent amount a day to brag about. Not enough to quit other work, but hope is good. I want to be a full time web content guy. But the other day I got crawled while my server was down and I’m all in red!! So my question is how often do they crawl your site? I hope its not more than a few days because my revenue just went up! Great sharing.. i thing almost 85% of google ad-sense user will see these error but they might never give it attention. but once i make recommended changes its not only improved Adsense Scorecard in fact now am getting high CPC and more Coverage per post. will like to see more tips and trick on this topic to enhance Adsense scorecard from you. IMO, Adsense Score Card is not very good. It shows false report some time and late in updating. I hope Adsense team will solve this issue soon. And I really agree with your idea, Liza! Thanks for sharing such useful information! IMO, Adsense Score Card is very annoying! And I really agree with your idea, Liza! Lisa, I really agree re going with ‘what works with your site’ best’. Image ads just don’t convert well for me, so taking that recommendation from the Big G is not going to help my conversion. Thanks for your email back the other day about site design. Now, I came to know why many bloggers are not using Adsesne. Thanks for clarifying. It is sad that google adsense are not yet accepting new sites, some are worthy and would help people tremendously. Another thing is that they sometimes suspend accounts without any notice, I have heard many of such stories. In the new Adsense report there are 3 scorecard: Revenue optimization, Site health & Google . My site health report is bad. I need to work on it. Thanks for mentioning important points how to increase scorecard. I have earlier checked my score card but never took that seriously. After reading your posts, I am thinking to focus on improving my score card. Thanks for your excellent suggestions. I never cared about Google Adsense Scorecard. Don’t know why they are forcing me to use Google Plus. It gives very bad feeling when I login to my Adsense Dashboard and see that my card rating is just 1 out of 5. But who cares ! I am getting much more without caring suggestions from Google. I think this scorecard needs some improvements. The new score card is a bit deceiving then, but the need to increase site loading speed is a real one, this is why you should make sure your website is optimised to load as fast as possible, this will ensure you give the visitor a good first impression. I used to focus a lot of Google Adsense, however, lost a lot of my income since the last Google update. I no longer focus 100% on what Google says. I agree with you that we all have to do what we feel is right for our websites. After all I feel like our main focus should be building relationships with our readers, not trying to make Google 100% happy. @Lisa can i put adsense on my blog ?? O very very useful post i don’t know this is google adsense scorecard. Working on improving my page speed, well.. it’s always nice to see some features that will help us optimize our site.. beginning to love it actually after seeing some improvements. Great post from Lisa again,keep it up. Ugh! The most infuriating thing about this scorecard is the fact that they don’t tell you exactly what adverts are falling below their “score.” Come on Google, be a little more informative! I just assumed it was a summary of your account in general. Also you should be able to figure it out if you create different channels for your units. For example if you have a sidebar unit and are using the 120 unit, you would probably improve your score by increasing the size to 300×250. So basically if you use the sizes that Google suggest your Revenue Optimization will improve thus improving your overall score. Very informative. I just wanted to say thanks. After coming across your blogs I finally decided to give it a shot. I’m still at the early stages. However, getting decent amount of traffic and earnings. Thanks! Hi Lisa, I am visiting your website first time and honestly I am loving the way you wrote this article but I have one question to you do you think this is possible to abide by every suggestions made by Google for all type of businesses? I personally think this is very difficult. Really enjoyed the article and going to bookmark your website for future references. I don’t know what the solution is. Did Google give you a reason why they rejected you? Typically they tell you why they declined your application. We’re ignoring our scorecard too. Keep doing what you’re doing. You should look for ways to restructure your campaigns and ad groups, and edit low CTR ads to boost ad group QS. Restructuring your ad groups is a good way to improve your account structure. Your visible history is erased when you move things around, but the history for calculating your Quality Score is preserved. If the AdSense crawler can’t properly crawl your pages, your ad units might return irrelevant ads. If you want the most accurate and useful ads, you should check to see if you don’t have any crawl errors. You can do this by logging into your account, and going into Account Settings. You will find if you have any crawl errors for any of your websites there. With the exception of ad type and formats, crawler errors and page speed issues I don’t think there is much in the score card that needs to be taken too seriously. However, I have a different question for you Lisa if you happen to read this. I have a niche site and have noticed that compared to last year even though my traffic has nearly doubled with the CTR being about the same, the CPC is on average about $0.20 lower than last year and the RPM average is also roughly $10.00 lower. I have not made any major changes to the site besides adding more content. Any ideas what could cause that besides maybe variations in the bidding for keywords? Thanks. Hi Lisa, I do not mind this score card, helps show what state some of my sites are in but I won’t change a thing yet and give it a few months to see where they go with this. I’ve been monitoring mine for about a week now and it’s changing, basically for the better, except for page speed. I’ve tested some of my pages before with the Google page speed tester and other testers and they all say my pages take way too long to load. I’m using SiteSell Lisa (actually bought it through you) and I’m not aware of any way to deal with the page speed issue. Any ideas? Cheers and keep up the great work…I always look forward to your next email…you’re full of great stuff! Appreciate you purchasing thru my link. I would think it has a lot to do with their template structure. Your site also has a LOT of images. Do you try to optimize them before uploading them? That is a huge reason why your page loading time is high. I would imagine that social sharing widget also ads to it. I’ll spend some time and go through all of my images and make sure that they’re as compressed as possible and re-upload them. Thanks for taking the time to respond. I don’t make much from Adsense but I have to say I like the Google Plus stuff.. I started setting up my YouTube channel yesterday and I found out that by linking to a Google Plus page I am able to take advantage of some kind of promotion they do where my site will show up in searches more often. I should have spent more time reading the message that popped up but it seems like a definite advantage. As regards slow sites – I moved to the free Quick Cache plugin and added WP Minify and WP Widget Cache and found significant speed increases over the other two most frequently advocated caching plugins (Super Cache and have a memory blank on the other one). The only adsense money I made has been on an old niche blog I started and dropped out of lack of ongoing interest. The 4 posts I made on it over a year ago made me about a dollar a day for the year. I did notice the scorecard when the year hosting was finished (last week) but didn’t look at it much. I agree with the person who said Google have too much monopoly – I just see a load of rules and my eyes glaze over. Some day if Adsense ever becomes something I take seriously as a method of monetization I will look at the scorecard thing again. Till then I just want to create quality content and practice blogging till I get good at it. I just moved sites over to the mocha theme from news theme, lo and behold my scorecard instantly improved…considerably. I have to say I think this is complete garbage…in the last week or so this has been up my “revenue optimization” has gone from a 5 to a 4 to a 3 and now back to a 4. And I didn’t do a thing to the ads in that time. Mine dropped one level too since I published this post. *shrugs* Who knows. This is exactly why I’m not too invested in what is shown there. Well, I have seen this scorecard and I have avoided it since. However, the new large skyscraper ad looks good in the right column of my site and I am waiting to see if it works well on some of my pages. I love it when persons give their feedback about the content on my website so, I prefer to use small ad sizes on my pages. As a matter of fact, I try not to have more two Google Ads on my pages. Thanks Lisa for the information, after reading I am able to make certain adjustment on my website so as to affect the score on the Google Ads scorecard. Everything that Google wants us to do is to their advantage, NOT ours. How I wish there is another new search engine right now that can compete with Google. When it’s a monopoly, they can do whatever they want. Why don’t you sell ad space, instead of using adsense? The revenue could be higher? I’ve already tested that. AdSense earns me 10x’s more because my eRPM is sky high on this site. Everything that Google wants us to do is to their advantage, NOT ours. hi, note that for the google plus score, you simply have to check the box “yes I have implemented that G stuff” in your adsense account and they show it as green, so it is really a gimmick, there is no check that you have a G page or a button on your site. As for the ad size, I understand sometimes you only have 250px wide space. But I wanted to mention that before I was hesitating between 300×250 and 336×280 and each had their advantages but I think the 300×250 was winning the argument. Well now the 300×250 images ads are competiting in a 336×280 ad block for best paying ad, so the 336×280 is now clearly the winner if you’re wondering to use 300×250 or 336×280, because 336×280 images ads are NOT competiting inside a 300×250 ad block..
James, you must’ve gotten your account back? Cool! out of interest, where is this checkbox? Well, if I had to follow all Google’s suggestions I’ll be cluttering my website and will be doing injustice to my readers. And of course, Google is always looking to increase its revenue – that isn’t a surprise; its so obvious lol! Thanks for sharing your opinion Lisa. Well… I am getting crawler errors, but they are from category pages and such like which are disallowed from robots.txt. I was told that was a good practice because it makes the number of your low quality pages go down… go figure. Also I get a “speed” red alert… I have tried to look at what they suggestions are, but I must confess I have no idea whatsoever what I am supposed to do… Anybody else has the same problem? There’s a browser plugin called YSlow that you can add on and it tells you more about what is causing your site to be so slow. nice tips i always see that message and always think that why this message. thanks for sharing.